The presenters at the 2019 NAACP Awards were told no Jussie Smollett jokes. Actor Smollett was charged with 16 counts related to his report of an attack earlier this month. Smollett blamed white Trump supporters for attacking him on a Chicago street at 2 AM in 2 degree weather when in fact he paid two Nigerian brothers to fake the attack. Chicago State’s Attorney Kim Foxx then shocked the country earlier this week when she dropped all charges and sealed the case. 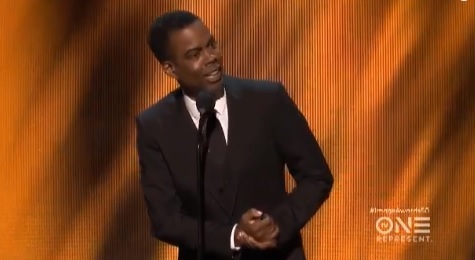 Chris Rock was told not to crack any Smollett jokes. But he didn’t listen. At least there one brave presenter tonight.